Most of us may be aware of the UNESCO World Heritage Site of Bheem Baithika, which is situated about 40 Kms from the Lodge (Same distance from Bhopal), however only a few would be aware that Kathotiya, an almost equally beautiful and elaborate Site containing Rock Shelters and Rock Paintings, dating thousands of years back, is situated hardly 10 Kms from the Lodge. Home to the Bhil and Bhilala tribes of central India, Kathotiya village lies secluded in the middle of a green valley surrounded by steep hills (Vindhyachal Ranges). Kathotia is a small forest village nestled among hills, with ancient cave paintings, reportedly over 17000 years old, abundant in wildlife and Birds, offering excellent opportunities for adventure sports such as rock climbing, rappelling, trekking etc. The Kathotia Adventure Camp is managed by a group of local tribal youth (an SHG created by the MP Ecotourism Board) and offers an excellent outing combining nature, adventure and heritage walks along ancient rock paintings, similar to the ones found at Bhim Bathika. Kathotiya rock shelters are basically spread over two hills, facing each other and have over a 100 marked, documented and researched, Shelters and Caves containing a variety of Rock Art, depicting what is believed to be a timeline period from 17000 to 500-700 years back. Therefore at some places one finds different paintings of different era, quite literally overlapping each other. The paintings are primarily in the regular Red Coloured Natural Dye but also use the White and what we saw for the first time in the area, Green Dye, to create a myriad of Rock Art, depicting the life and times of the era. As we now wish to offer Kathotiya Rock Shelter & Cave Visits on a regular basis to our guests, therefore we wanted to experience the place for ourselves, so that we are able to prepare our guests for the outing. 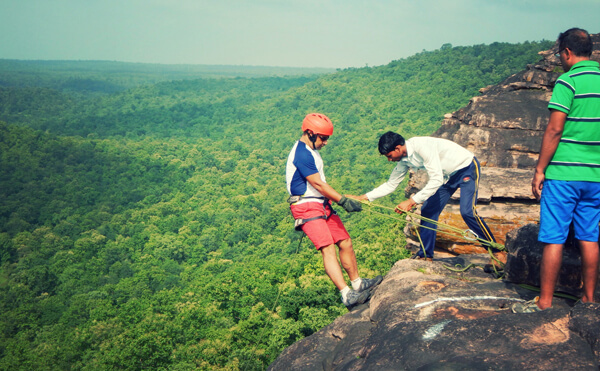 The Madhya Pradesh Eco Tourism Board (GoMP) has created a Self Help Group in Village Kathoriya, with over 14 trained and registered guides, who are available to take the visiting guests on the trail and also help conduct the Rock Climbing and Rappelling activities, at Kathotiya. Unfortunately, their training did not include the historical and anthropological description and narrative of the place, for which we had to source a Book written by Dr. Shankar Tiwari, a noted researcher, who is credited with discovering the place and documenting and chronicling the entire area in the year 1975. Kathotiya, till date remains quite unexplored and a noted architect from Bhopal, still continues the research and documentation in the area. One can only imagine the surprises which lie in store, waiting to still be discovered. The trek begins from Kathotiya Village and after about half a Km of flat land, starts ascending on to the Hills, with altitude varying between 1500 to 2000 feet (MSL) and has a steady ascent. Once the primary ascent is completed, the hill is more like a table-top, with a very gradual ascent. The Shelters and the Caves are beautifully perched on the face of the hill itself. The guides skilfully navigate through, what would appear an impossible approach and before you know it, the shelters begin to appear, one after the other, in a series, containing a plethora of anthropological and archaeological wonders. As one walks from one shelter and cave to the other, the approach, many a time, through tunnels carved out by water over millions of years, are a delight by themself. As you wriggle your way through the narrow gaps, contours and cracks in the rocks, the trek itself becomes all the more exciting. What surprised us the most was the fact that this is a place which people still remains quite unaware of. What people generally associate with this place is primarily rock-climbing, rappelling, mountain biking etc, which is mostly conducted on the northern hill, adjacent to the SHG Centre and we were informed by our guides Madan and Vijay, that we were perhaps the first trekkers who visited the southern hill, housing the Rock Art and walked through all the Shelters and Caves, since the month of April. This itself, perhaps best describes how little people know about this amazing extravaganza of rock art, shelters, caves and a truly enchanting trail to trek on. A treasure, just waiting to be unravelled, discovered and explored. The trek, about 7 Kms in all, would take about 4 hours, depending on how much time one spends in the Shelters and Caves, how many one visits and what the halts and stoppages, and there would be many, as every corner offers a panorama like none other, are like, and eventually culminates at the pinnacle of Firangi Pahad, drawing its name from the ‘Colour’ of the Local Tribals of the Area, who are believed by the locals, “as described” by Madan and Vijay, to be the descendants of Westerners. The return journey traces a different path, descending from the Firangi Pahad (Hill) down to a trail used by the local tribals from the Neighbouring village of Jhiri linking Kathoriya, which is a flat terrain with rolling grasslands and a beautiful jungle. Here one is able to see the shelters from below, as to how precariously they hang from the cliffs and precipices. Plan a visit to Kathotiya with us and Trek through Time itself, enjoying the bountifulness of natural splendour offered by the Vindhyachal Hills. Forest Guides: Pramod, Vijay & Madan. 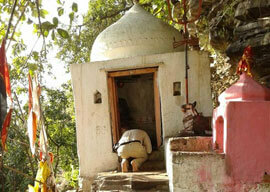 About 14 Kms from the Lodge, inside the Sanctuary, is a beautiful place called Kehri Ka Mahadev. It’s an old Shiva Temple, tucked away, deep inside the Ratapani Jungles, almost as if reclaimed by the jungle and lost in time, amidst the enchanting Vndhyachal Ranges. The drive to Kehri Ka Mahadev, winds its way through the table top mountains, offering a spectacular view of the valleys below, almost throughout the drive. Deep in the valley below, the Kolar River winds its way ahead and as you stand atop any of the numerous viewpoints all along the way, you can hear the gentle murmur of the river meandering its way forward. The drive, a total of about 30 kms (to-n-fro), winds its way through the lower Vindhyachal ranges, slowly ascending on to a plateau, whereafter the drive is mostly along the edge of the hill, on one side and the beautiful Ratapani jungles on the other. Kehri Ka Mahadev is a perennial waterfall emanating from a sandstone hill, about 500-700 feet in height and as the water oozes out and trickles down from the hill face and rock contours, it traces its fall through the hundreds of roots of many old Banyan Trees growing on the hill face. The entire hill face is covered with moss and ferns and remains as picturesque, throughout the year. There’s a quaint little temple on the edge of the hill, halfway down, deserted, as it’s now well within the Sanctuary boundary, presenting an ideal setting for meditation. As you reach Kehri Ka Mahadev, you have to walk down a stairway, to the quaint temple, perched halfway on the precipice. The entire hill remains filled with moss, ferns and grass, through the year. The water flows down in the valley below forming a small rivulet, creating a beautiful oasis, attracting a myriad animal, birds and butterflies. Even during summers, the area remains cool and pleasant. What would really make you happy was that there are still such wonderfully mystical places left. A short distance from RJL. One of the most 'spiritually enchanting' place to come across. Tucked away, deep in the Ratapani Forests, under a magnificent sandstone hill, sheltered and hidden, so-much-so that it remains virtually invisible even from the hilltop itself. A "Shiva Temple", so mesmerizing in it's beauty and setting, so peaceful and serene in it's surroundings, that one immediately finds true "inner-peace"..... Most certainly a place one can find a divine connection. The soft and gentle sound of water trickling down from the roots of the overhanging banyan trees, engulfing virtually the entire hill face, is truly soothing and hypnotic indeed. 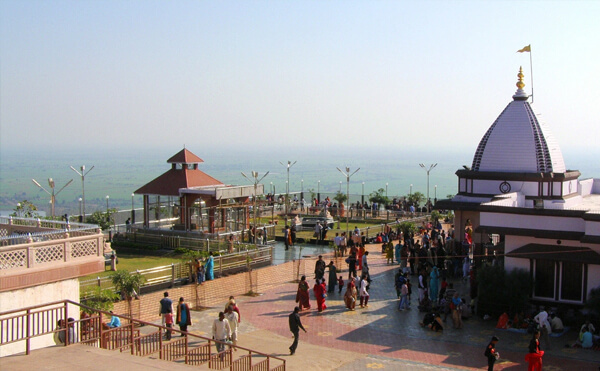 Salkanpur Temple is situated on an 800 ft high hillock, over 2100 feet above the sea level, in the heart of the Vindhyachal Ranges. The approach to the beautiful and mystical temple can either be by a road, winding its way up the hill or by stairs, with more than a 1000 steps. Those, however, who don't wish to drive up or take the stairs can use the ropeway service, an easier and a more exciting way to reach the temple. Through the ropeway, one will reach the rear entrance of the temple. The ropeway goes over a pond and over a dense forest area right up to the hill top, all along offering scintillating panoramic views of the beautiful valley below. Salkanpur Temple is located in near Rehti village Dist. Sehore Madhya Pradesh, a mere 30 kms from the Ratapani Jungle Lodge, about 25 km from Hoshangabad, 45 Km from Itarsi, 70 km from Bhopal and 150 km from Indore. Devoted to one of the incarnations of goddess Durga, the presiding deity in Salkanpur Temple is of Ma Durga Beejasan. It is also linked to the legend of the Shaktipeeth in Hindu mythology. With this mythology this place has gained its own religious value and its been now a pilgrimage for millions across India. The seekers, visionaries and religionists, rich and poor, noblemen through ages, sought and found solace in Salankanpur. It is a place of unmatched natural beauty and tranquility, where calm and repose are all-pervading. Even though the temple is quite old, however it has been renovated and is now very well maintained by the Salkanpur Trust. We began our drive up to Salkanpur, from the Lodge just as the evening was setting in. The drive was through a dense teak forest and through a beautiful road winding its way through the Vindhyachal Ranges, before descending into the Narmada Valley at Aamdoh, near Jholiyapur Dam, about 14 kms from Malibayan, near Rehti. The drive through the jungle was itself a wonderful one and therefore we took our time, stopping virtually at every curve, admiring the view of the Delavadi Valley and the lovely forests, as far as the eye could see. As we finally emerged from the ghats, near Jholiyapur, crossing the Sanctuary area, we caught the first glimpse of the Hill, on top of which the Temple was perched. Though the air was filled with a lovely mixed fragrance of wheat fields and forests, not far, we were keen to reach Salkanpur and therefore, sadly couldn’t stop as much as we would have liked to. As we reached the entrance to the temple, at the foot of the hill, we were blessed with a divine view of the setting sun, across the valley, however, the staff at the entrance was keen for us to begin our ascent towards the temple and as such urged us to spend as less a time as possible, along the way to the top. Reaching the top of the hill at the entrance of the temple itself, we could feel the nip in the air, on account of the altitude we had gained. The view all around was scintillating to say the least. We took a few pictures and walked briskly towards the temple, eager to reach the premises. As the temple emerged, situated at the very edge of the hill, we were amazed to see its sheer beauty, grandeur and magnificence. And when we say this, it’s not the temple alone, but the entire ambience that surrounds it, the aura and the sheer power, that you feel. It is a marvellously beautiful feeling. As you walk along, all around the temple, you can only admire the gaspingly beautiful view of the valley below, all around you, enchanting, breath-taking…. You stand humbled at the grandness of it all. The entire premise was clean and well maintained by the Temple Trust, with ample space to sit and meditate. These are places were one finds it easy to do so, to connect with the divine and with oneself. As it was well past dusk, we did our best to capture the valley below, all around the temple, even in the failing light, as the villages below, began glowing, welcoming the night. Ginnorgarh Fort is situated about 35 Kms from the RJL (61 Km far from Bhopal), The approach from RJL is via Malibayan, or a drive straight through the Sanctuary, via Mathar. Surrounded by a lovely teak forest, in the enchanting Vindhyachal Ranges, the area around the fort is abounding with breathtakingly beautiful natural beauty. A pristine mountain trail for trekking, camping and bird watching, the fort in itself, reclaimed by forest and forgotten by time itself, is teeming with wildlife, unseen, hidden and tucked away from civilization, as if holding a million secrets and stories untold, just waiting to be discovered. The fort is perched on a hill with an elevation of about 670 Meters (about 2345 Feet from MSL) upon a plateau of about 1,127 metres Length (3944.5 Feet) and a width of about 266 metres (931 Feet). One can only wonder and imagine how the Gond kings would have built this fort, at this altitude, with such a treacherous climb. A marvel in itself. The fort was once a stronghold of Gonds, but later, fell to Dost Mohammad Khan, the first Nawab of the Bhopal State. The fort is practically carved out of a hill itself, with only the two of the seven 'reported' floors visible above the ground level. One of the architectural splendors of the fort is its water management. The fort has an amazing array of Bawadi,s (water tanks) virtually woven all over the hills, at various places, at different levels. As per our guide, Jeetendra Jaat, there are 52 recorded Bavadi’s, which were taking care of the water requirements of the fort, at the time. The fort has two fabulously designed and built palaces, the first being the palace of the queen and the other and slightly grander being the palace of the king. 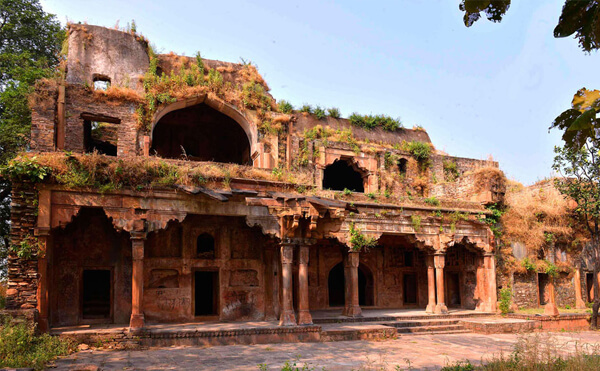 As per our guide, the story goes that the palace of the queen was connected with an underground tunnel, to Bhopal, to the Queen’s other palace, the 'Rani Kamlapati Palace', Kamla Park, Bhopal. Weather true of myth, the romantic story, involving the Queen, as narrated by the guide, gave us goosebumps. The top of the fort offers scintillating views of the valleys below, forests all around, as far as the eye can see. A few miles away, visible from the top of the Kings Palace, is the hill on which the Stables, at the time were. The structures housing the personal guards and the staff etc, are built below the main hillock. The Hill housing the famous Salkanpur Devi Temple, is also visible at some distance. The Fort, falling in the core area inside the Sanctuary, requires permission from the Local Forest Office at the gate of the Sanctuary itself, where a guide from the MP EcoTourism Board, is assigned by the Ranger Office to accompany you. The Trek to Ginnoregarh Fort is about 4.5 Kms, one way and a total of about 9 Kms in all and goes through a dense forest, within the Core Area of the Ratapani Sanctuary. This is the heart of Tiger Country, with the area boasting 10 tigers, showing regular movements, over 27 leopards and scores of Sloth Bears and numerous Herbivores, all this within the realm of the hills on which the Fort and its allied structures are built. As such, the trek up to the fort requires permission from the local Forest Office, with an entry fee and an accompanying guide. The trek has two parts, one being in the relatively flatter portion, winding around the hills, with a gradual ascent and the other, second part, being a steep uphill climb, up to the fort, which is at the last leg of the trail. There are two options for the trekkers, a simple gradual uphill climb, or a steeper climb, which is a relatively difficult one, however offers spectacular and scintillating views, all along the way, full of excitement and adventure, every step of the way. There are lots of waterholes all around and therefore there remains a good chance of spotting wildlife, if one’s lucky. As one climbs up to the pinnacle of the hill, almost 670 meters, 2345 Feet above the MSL, one literally doesn’t see the Fort till almost the last few steps at the very top, the fort being so well hidden in the dense forest cover, with the fort virtually emerging and appearing out of the forest at the very last moment, a lovely surprise as one gets to the top of the hill, almost like saving the best of the trek, for the last. For the adventure enthusiasts (with an accompanying guide and due supervision) the "Kathin Rasta" (difficult climb) would offer all the thrills they would come to expect from a good trek and the descent can be from the regular route, which is what we did. However, due advice from the Guide and ones own desire/capacity to 'cross-country' should finally decide the route to be chosen. Delawadi is a picturesque picnic spot, situated 59 km from Bhopal in Raisen district, lush in scenic splendor and natural beauty. 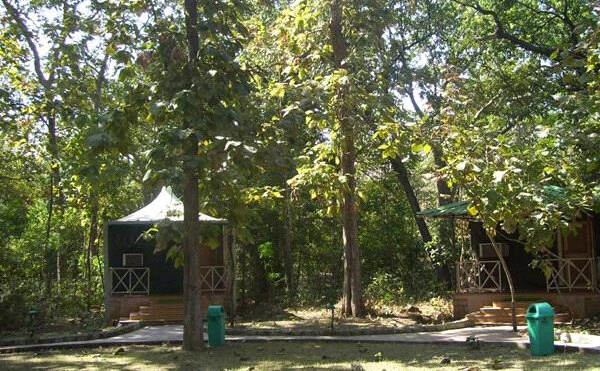 Madhya Pradesh Eco Tourism Development Board has developed Delawadi Forest Camp as a peerless eco-tourism destination. Surrounded by beautiful dense forest, Delawadi is occupied with a cafeteria, seven double-bed tents and pagodas for get-together. The tourism department offers camping, trekking and bird watching facilities in the forest. Kairi Mahadeo, Bhadbhada Falls, Sunset point, Ran Bhainsa rock shelter, Ginnograh Fort (3 km from Delawadi) are the nearby attractions. The Betwa or Betravati is a river in Northern India, and a tributary of the Yamuna. Also known as the Vetravati, the Betwa rises in the Vindhya Range just north of Hoshangabad in Madhya Pradesh and flows north-east through Madhya Pradesh and Orchha to Uttar Pradesh. Nearly half of its course, which is not navigable, runs over the Malwa Plateau. The confluence of the Betwa and the Yamuna Rivers is Hamirpur town in Uttar Pradesh, in the vicinity of Orchha. In Sanskrit "Betwa" is Vetravati. This river is mentioned in the epic Mahabharata along with the Charmanwati river. Both are tributaries of Yamuna. Vetravati was also known as Shuktimati. The capital of Chedi Kingdom was on the banks of this river. Bhimbetka alias Bhim Baithaka Caves are the rock shelters situated 46 Kms south of Bhopal at the southern edge of the Vindhyachal hills, lies in Bhiyapura village in the Raisen District of Madhya Pradesh. 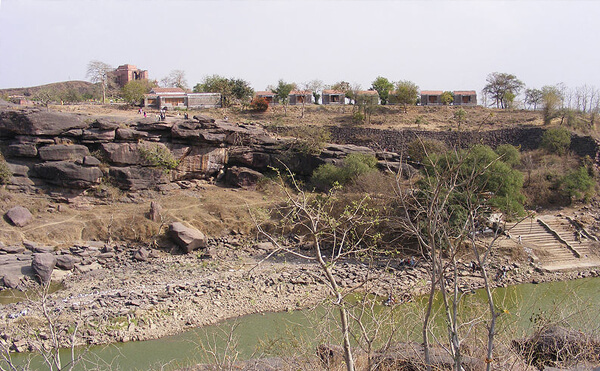 The place derived its name Bhimbetka from the word Bhim ka bethika which means the place where Bhim sat and meditated. 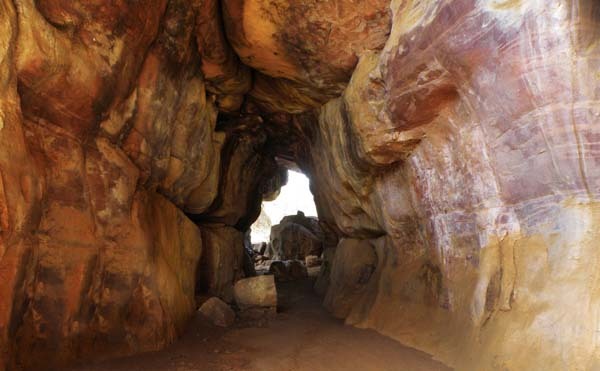 In the rocky terrain of dense forest and craggy cliffs, over 1000 rock shelters belonging to the Neolithic age were discovered in 1957, by VS Wakanker of the Vikram University, Ujjain. Bhim Bhetka as declared a UNESCO World heritage site in July 2003, thus becoming the 22nd site in India to receive the status. Kolar Dam, Adjacent to the Forest Rest-house.